Komodo Island named from the famous lizard living on it is the biggest island of the Komodo National Park with 390 km2. Located at the western part of the park, Komodo is less visited than Rinca Island due to its location making it a bit wilder. With an estimated population of 1 000 dragons living on the island, it is slightly less than Rinca. Wild pigs, water buffalos, Sumba deers, monkeys, wild horses and many snake species are present on the island. Komodo is composed of three different type of vegetation with savanna all around the coastline covering 70 % of the island, monsoon forest with a dry tropical forest located between sea level and an altitude of 500 meters and the quasi-cloud forest above 500 meters. Mount Satalibo is the highest point of Komodo reaching 730 meters high. Two of the most famous spot of Komodo National Park are situated on Komodo, Pink beach and Gili Lawa Darat. A ranger station in the small fishermen village of Komodo will welcome you to discover the habitat of the Komodo dragons in total safety. Do you want more information about Komodo island in Flores? 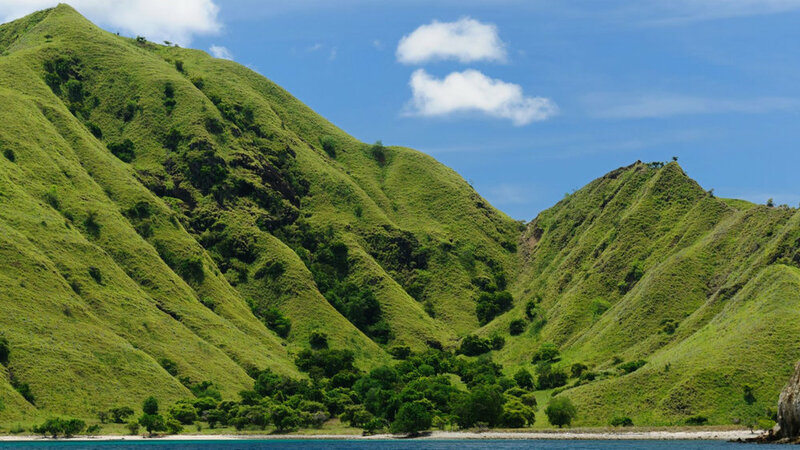 The Komodo island will transport you into real Jurassic Park life. A thrilling experience where you will walk by feet, deep into the lair of Komodo dragons, without any jeeps or remote-controlled car to carry you around. This is the only place in the world where the only living dragons roam free in the wild. A treasured national park where you can let out your inner Mother of Dragons fantasy for a legitimate reason. Komodo Island rises proudly from the tropical greenish blue water of the Flores Sea, stripes of clouds floating behind its looming mountains. Once the Komodo Liveaboard dock to the shore, you will be welcomed with a wild west version of the usually tropical Indonesia. The open landscape features rocky outcrop with dry forests and auburn path, and high rising Palmyra palms punctuating the clear sky. Every jagged corner of the browning land screams for adventure, and that’s for a clear reason. And with the last survivor of prehistoric gigantic lizard live and breed around the island, you have officially set foot in the Lost World. Komodo Island is one of the biggest islands of Komodo National Park, which also comprises the neighboring Rinca, Padar, and dozens of other smaller islands around. As part of Lesser Sunda Island archipelago, Komodo Island is located in the westernmost of East Nusa Tenggara, right in the verge between the province and its neighbour, the West Nusa Tenggara. Arriving on Komodo dragon Island, you will be instantly mesmerized by the outlandish wildlife. Highly affected by the dry climate, normal temperature can reach up into 40ºC and result in stony hills and savannah-like vegetation. Grass and shrubs cover most of the rugged terrain, occasionally dotted with orchid and trees. Lush mangroves forest clumped in the sheltered bays and mostly remain green all year round. The island is the greenest during the monsoon season when heavy rain falls and the leaves started to grow anew. 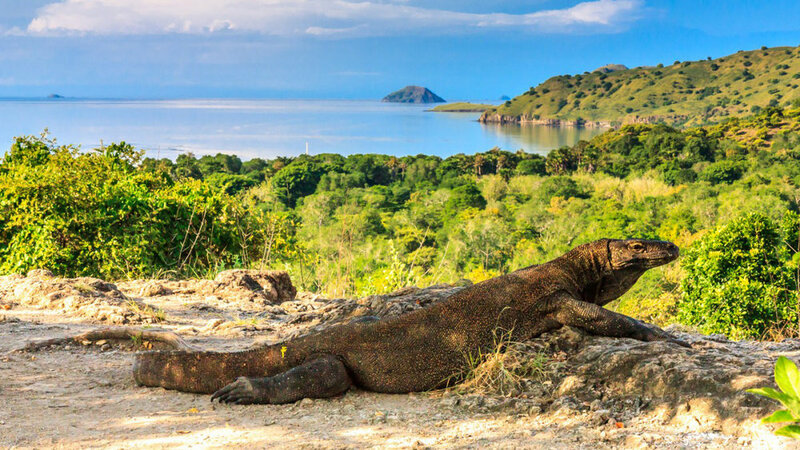 The tiny region of Komodo National Park sparks aura of primeval mystique as this is the only region in the world where you can meet the dragons who have survived from the ancient times when all of their Giant Lizard cousins has vanished from the earth. The dragons cannot endure zoo life, and sun-burned Komodo Island, Rinca, and surrounding islands are again the only place to provide a perfect habitat protection for hundred thousand of years that enables the dragons to continue living into the present day. The Komodo-populated island was established as UNESCO World Heritage Site to protect the endangered species. This carnivorous beasts receive strong support from the Indonesian government, full international protection from its UNESCO preservation status, and enjoying lots of appreciation from the locals. They are probably the nation’s best-protected animals if you compared them with other endangered species—the orang-utans, rhinos, and elephants—as their rainforest continue to regressed and converted into oil palm plantation each year. The Komodo dragons are living their preservation life without a fear of expulsion, human aggression, or being shot just for coming too near to the village. In Komodo Island, human dwellers and the dragons coexist in a somewhat peaceful setting. Villagers feed the dragons with livestock to keep their bellies full and make a living as rangers and tourist guide. In turn, the Komodo only need to behave and be a good national ambassador and most of the times, be the star of adventure among the selfie-snapper travelers. Take the Komodo tour and commence on wildlife exploration with the native rangers. You will trace an open, dry path that will lead you into a very Jurassic, jagged landscape where the Komodo lives. Leave your fear in the shore and embrace on the path that will take you inside that hilly mountains, deep into the dry forest and observe the dragons in their most natural habitat. You will pass its open-space lounge doubled as expanse dining room, the waterholes, the nests, and the nursing trees where baby Komodo lives and sleeps. When you are lucky, you will pass resting deer and water buffalos in the wallow, lying so innocently without any slightest idea that they will, sooner or later, end up in the dragons’ belly. Now tighten your trekking shoes and put on your hat, as you will walk straight to the dragon’s territory. Without any fence to separate the trekking path and the Komodo living space, your Komodo trip will be injected with a heavy dose of thrill and grotesque reality. Most of the times, there will be hardly any group of tourist nearby; it’s gonna be only you, the ranger, and the dragons. The remoteness is what will bring you closer to the prehistoric lizard, with only the sounds of dry leaves under your steps and occasional screeching from the dragons to fill your adventure. This is something beyond the regular zoo trip, where every step you take will feel like real life, firsthand experience of out of Nat Geo or Animal Planet channel. Telltales that once upon a time, a princess lived on a secluded island, and was called the Dragon Princess among her people. The princess married and her tummy started to grow, bearing the fruits of their love. She gave birth to a twin, a boy called Gerong and his sister, a baby dragon named Ora. The boy lived among the villagers and the dragon set to the forest. Since then, the human and the dragons shared the island together. The villagers never try to hunt the dragons and they lived in harmony. Today, the dragons act as tourism main attraction and invite cash flow to the far-flung island, while their human brothers are here to guard them and fill their belly full with abundant livestock. It’s easy to dwell into the myths and tales of dragons, particularly when it involves fire-breathe, a human twin, or enormous body flying in the sky. The truth, however, sometimes is, even more, stranger than fairy tale and that’s what you will experience during your Flores Komodo tour. Hundreds of tourists flock to this eastern frontier part of Indonesia every year, lured by the dragons. And each year, this gigantic lizard never cease to awe everyone. Teamed with the primeval-looking vegetation in the island, the huge reptile gives a very strong perception of ‘last descendant of dinosaurs’ for first-time travelers, and they are not necessarily wrong. Especially when names like “real life Jurassic Park” is entitled to the island. The Varanus Komodoensis, as their Latin name goes, has been scientifically proven to not having any relations with the dinosaurs, but they do have an ancestral link to the prehistoric era. 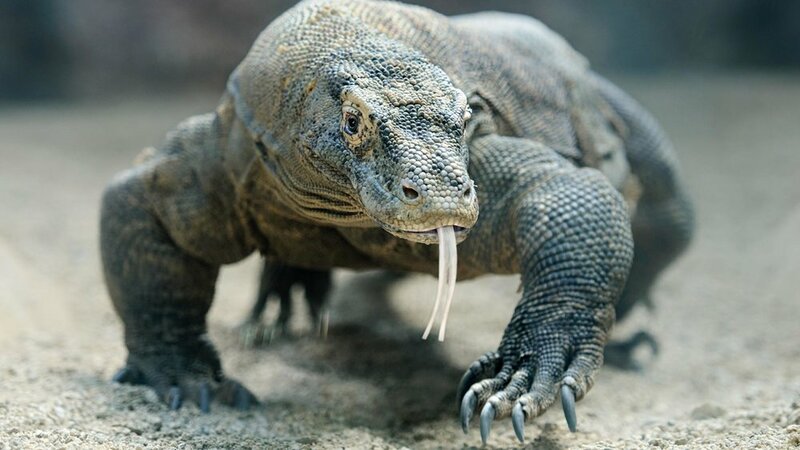 The Komodo dragons are the last surviving descendant of Megalania, a group of giant monitor lizard that once roamed the earth around 4 million years ago. It’s very interesting to know that, through fossil findings, the Komodo dragons did not change much since its existence in Flores for at least 900,000 years ago. These ancient lizards are indeed prehistoric, and practically living fossils. And that’s how the Komodo dragons look like. Coming to Komodo Island might surprise you with the realness of this dragon. You will be greeted by a powerful-looking beast, a giant and bulky lizard that can reach up to ten feet long (three meters) and weigh more than two hundreds pounds. Dark colored scales cover its entire body into the tip of their long, heavy tail. Four stubby limbs outstretched from the body, black curved nails protrude from each toe. Rather than flying, the dragons walk rather awkwardly—its large body sway right and left each time their legs stomp the ground—but not less dangerous. Remember that they can run at speeds up to 12 mph, and easily outrun you albeit the clumsy walk. From their folding neck stick a rather flattened head with a rounded snout, and just how dragons in the legend have, two large nostrils perch on the top of it. It’s just our dragon doesn't steam smoke from their nostrils—in fact, their nose is not very good for smelling. And from that slimy mouth, a long forked tongue darting out, so long that it almost touches the ground. The flicking tongue helps the dragon to feel scents of particles in the air, and it can spot their food as far as 8 km away. In the middle of a hot and barren island, the Komodo dragons live as the apex predator in the fauna kingdom. They don't get their name for nothing. As if the fearsome appearance is not enough, the dragons outperformed any other predators while it comes to hunting. Unlike other known predator, Komodo dragons hunt in a very peculiar way. These beasts are smart at camouflage, and they will use their ability to mingle with dry land and manage to look as still as a huge rock. The dragons will patiently wait for their oblivious prey to wander around before they suddenly ambush from the bushes. The long and curved claws—which also effective to dig soils and hide their eggs—will pounce their prey down and bite the poor creature. But, they won’t take the dinner right away. The dragons' venomous saliva, excreted from venom ducts, is high in toxin and anticoagulation. Once the venom is inflicted in the open wound, the poor prey doesn't stand a chance. Though it can manage to escape from the beast, it will soon fall down due to heavy blood loss with extremely painful cramping, shock, and heightened sensitivity to pain which happened all at once. And the dragons? They can calmly walk around the trail, sniffing the scent of their wounded prey with that forked tongue. When the prey exhaled its last bite, the dragons are more than ready to feast. The exaggerated blood loss enables these beasts to tackle larger prey as big as water buffalos and horses, though deer, boars, and goats remain as the favorite. With their serrated teeth and powerful jaw muscles, the dragons can swallow up to 80% of their body weight just in one eating. However, one large meal will keep their carnivorous belly full due to their slow metabolism. But they won’t resist occasional fish snack from the rangers! Wondering about the seemingly lazy dragons you meet around the park? To keep the tourism safe from any attack of hungry dragons, the locals have fed them with livestock early in the morning, so this beast will not think about you as a group of bonny lunch. Especially when everyone is trying to stick their camera to the dragon’s snout. When you think that these dragons are deadly enough, wait until you know that these wonderful beast are gifted swimmers. They swim just like crocodile and can easily pass the straits between islands in Komodo National Park, aiming for more food in the neighboring island or looking for a partner to mate. The real story of mother of dragon might not be as majestic as what it is in the TV shows. Life doesn't come easy for the babies. While most of animal’s infant clung to their mother for food and protection, the baby Komodo has to run off the nest as soon as their eggs cracked open and instinctively climb the nearest tree for shelter. The dragons are known to eat their own kind, and these baby crawlers are easy targets for the bigger ones. And that includes their own mother. When Mummy is hungry, she won’t recognize her own offspring and proceed to munch one of the unlucky kid. The hatchlings have to climb up on the tree and remain hidden, nibbling on caterpillars and small animals if they don't want to be chewed by the uncles. They will spend the first four years of their life until they got big enough to return to the ground and live for another 30 years. As adult Komodo use their smelling abilities to find food, the young one covers themselves from their cannibalistic kin by coating themselves with intestines of dead animals or fees to conceal their smell. The young dragons have to do everything to pretend that they don’t exist and avoid being eaten. Komodo dragons might be the stars of the shows, but Komodo National Park’s natural spectacle will charm you with its incomparable beauty. You can have a dozen cool things to do during your Labuan Bajo tour that will keep you busy for days after an exceptional encounter with the dragons. When you travel to Komodo Island, it’s almost inevitable to embark on an exploration of the surrounding islands inside the National Park, which are very reachable by your Komodo Liveaboard. The Komodo archipelago boasts dozen of outlying paradise islets that still rarely see human’s footprint up to this day. Many said Flores and Komodo National Park as a pure piece of fallen heaven, and its home to abundant stunning landscapes, vibrant hues of bluish-green bays, outlandish rolling hills that make you feel like being transported in the middle of African savannah, and a very whimsical mountain with very moody, three colored craters. Nothing can be spent in vain while you are spending the time in Komodo, one of the New 7 Wonders of Nature. The Komodo National Park invites every outdoor enthusiast to venture into every border of the islands; to trace every pristine beach, to scale the scenic trail in the Padar Island, to take a Komodo island diving in the sparkling water and admire one of the best diving region in the world, and watching the awakening of thousand bats from the mysterious Kalong Island, screeching endlessly with the bloody sunset sky dropping in the background. A very rare beauty in the world, only a few strips of pink beach adorn our blue planet. Some of them dotted the shores of Komodo National Park. You read it right. The famous one in Padar Island is not the only one, thanks to the presence of red coral reefs across the underwater region. In the corners of Komodo Island, lies a few strips of pink beach that remains hidden from major tourism, and your Flores tour can bring this little blissful luxury to you. It’s in the remoteness of Komodo Island, where only a handful of tourists are sharing the beach. The pink beach, or “Pantai Mera” as the local calls, is glowing with shimmering pink as the clear water lapping the shore. Take a closer look at the rosy shore, and you will see tiny red corals, broken into microscopic pieces, mingles with the white sands and let out the gentle pink hues. On a bright, sunny day, the pink sands get even more beautiful with the contrasting sparkle of turquoise water in the background. Maybe this is how it feels like to walk in the middle of a dream. Have your holidays been even more heavenly? After reaching the Pink beach, the rest of it is just blissful indulgence. This is literally a place where you’ll wish to spend all the afternoon. Take all of your time to sunbathe and absorb all the dreamy rosiness of your surrounding. Snorkel to the insanely clear beach and enjoy the rich corals, just a few meters from the shore. Marvel to one the side hills and savor the blushed sands from afar, where the pinkness of the beach is more visible than up close. Take an awful lot of photos, you just visited one of the rarest beaches on our planet earth. The terrifying feature of Komodo dragon might have pumped you up from the start, ready for some adventure-channel actions. Particularly when you have watched he documenters how they run as fast as a dog to catch their favorite prey. The real meeting with the dragon, however, is best done without anyone pretending to be an adventurous star. Though it’s not as adventurous as what it has been shown in the documentary channel, you will wish the Komodo to stay well-behaved and as calm as possible. The Komodo is very dangerous and any trek to their lair should proceed with high level of caution. Your first face to face encounter with the dragons will most probably involve the dragons lying out lazily in the open space, limbs outstretched to their side. Lounging in the shades without seemingly any care to spare to the enthusiastic tourists, these huge beasts appear languid and sluggish which can be very deceitful to anyone. That’s it until they started to move when you will realize how scary and dangerous they are. It’s almost compulsory to take a Komodo ranger with you, though you are actually allowed to enter the park without any. Keep in mind that the Komodo is a dangerous primal hunter; they will only listen to their basic instinct and you will never know when they will decide to attack. The rangers have been working with the dragons for almost all their life. They know almost every inch of the park, they have a deep understanding of the dragon’s behavior, and most importantly, they know how to tackle a dragon once it shows signs of aggressiveness. The rangers can even be your selfie buddy with the beasts! Pin it to your mind, “stay and never stray.” Remember that Komodo is very great at blending with the island’s surrounding landscape? That means they can hide in the bushes, lying very still and be very hard to spot. Strolling beyond the trekking paths means you have a higher chance to run across a camouflaged dragon. And there’s a good chance that with their powerful smelling sense, the dragons have detected you long before you can spot them. That’s absolutely not a good way to end a journey. Do you recall how predators hunt in wild documentary shows? They never attack a group of prey. They will wait until one of the prey wanders off alone from its group, and that moment they will launch the attack. As one of the biggest predator on earth, Komodo will do exactly the same. Always stick to a group and never walk around alone, even for a quick bathroom trip. Tell your ranger if you want to do your toilet business, and he will guard you against any naughty dragons. These giant predators are the last thing you want to disturb. Coming too close (even for a snap) might trigger their combat-mode and they will ignite an attack. Take your shots from safe distance and never poke your selfie stick too close to their territory. Let’s wish that this scenario will never happen, but when it does, remember to run zig zag. The dragons can run as fast as 40 kph, and they can outrun you anytime unless you run in a zig-zag pattern—they difficult motion confuse them and they will quickly give up. It’s important to remember that the dragons rely upon their sense of smell, and they can smell the taste of food from 6 miles away. And they can follow you when you have the slightest smell of blood, thinking of you as a yummy food. Always tell the ranger if you have cuts or period. We don't want to threaten the dragons, do we? The remoteness of our Lost Island making it seems very unreachable, while it actually very accessible. 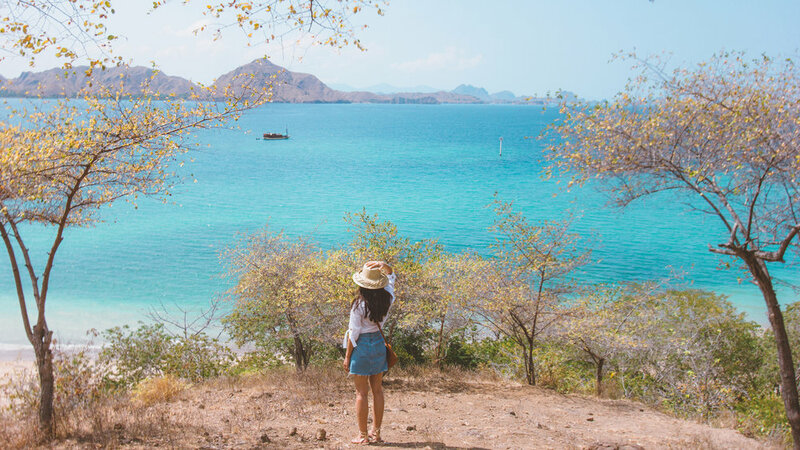 For an island that looks like it just appears from the prehistoric era, it actually just a 1-hour flight from Denpasar (our beloved Bali) to Labuan Bajo. The Komodo Island is located in the off coast of Flores, and you will need to arrange a Labuan Bajo trip to get you to the island. It’s a 3 hours Komodo Liveaboard ride in the open sea, and Hello Flores will ensure your excursion filled with lots of nature’s delight.